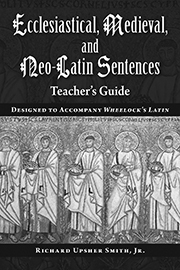 The Teacher's Guide is a wonderful resource and companion to the Ecclesiastical, Medieval, and Neo-Latin Sentences text. I am a beginning level student, currently studying from home, and this guide is clear and concise! Which is extremely important for adult level independent education. Not only does the Teacher's Guide give the translations, but it explains the translations as well. I highly recommend this guide if you have the sentences book. As for Bolchazy-Carducci, the company is amazing. I ordered my book, received the confirmation email, and received the book in record time. Very efficient and professional. The book was in wonderful condition. Far too often companies abuse their books during shipping, my book was just like on the shelf!